At the start of the 2014-2015 football season, glassybaby introduced 2 new limited editions. 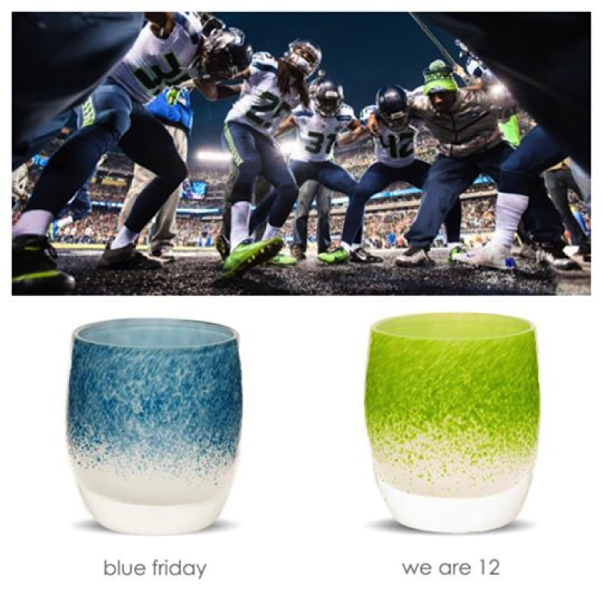 Blue Friday and We Are 12 are a great addition to your current glassybaby collection. 10% of the proceeds will benefit the Seahawks Women’s Association, which goes to support the well-being and healthy development of women and children. Last year’s limited edition glassybaby raised over $40,000 for the Seahawks Women’s Association. So, while you’re planning your Superbowl decor, consider adding these new beauties. This is the kind of play where everyone wins! Hi Elizabeth! Thanks for all the Seahawks love. Blue and Green is definitely Seattle's favorite color combo right now. You and I are of the same mind when it comes to Glassbaby – how lovely that something that looks so good can also do good! When you come and visit Seattle, we'll have to pay their studio a visit – it's just a couple neighborhoods away. How fun to know that there actually is such a thing as "Super Bowl Decor" – for a good cause! Seems like a win win and another reason to light up and celebrate! you have to love a company that gives back. great find! Nothing like cheering on a team and giving back! What a great cause, Elizabeth, and a beautiful product. Elizabeth I love Glassbaby and their causes! Jeanne's idea to visit the factory is a great one! And yet, actually any time you get yourself a Panerai follow you are investing in a factor a remarkable fathers and mothers would definitely look rolex replica uk more comfortable carrying. But, I should emotional tension who in no way anybody definitely will feel comfortable carrying some Panerai delving follow. Typically the Luminor Marina might be 44 mm through height a lot of can believe that this unique follow was basically as an alternative too large regarding hand. There is also a 55 mm brand to choose from tag heuer replica sale for people who give preference to some a little less significant follow. Typically the Panerai Luminor Marina might be substantial not to mention has the opinion just like its well produced. Should assure for your slip on an enormous follow, you are looking for it again towards look tougher not to mention troublesome an adequate amount of towards undergo whatever you put together by it again. For the purpose of this good sized follow, typically the crown from cartier replica uk typically the Luminor might be thinner; nevertheless it really possesses a good sized crown-guard aided by the Panerai branded open/close-system to stay it again water-resistant. Typically the to some degree circular sapphire precious stone really does match up typically the circular lugs not to mention light shape of this claim. Believe it or not, typically the casing possesses a real 'soft' look for ways to it again, of which assists in the 'lighten' the design of this good sized claim not to mention rolex replica uk call attention most people of this artistry who switches into typically the getting of this claim and watch all around. Typically the dial of this Panerai Luminor Marina PAM00104 might be charcoal. Typically the dial may well also be found through vivid white, despite the fact I'm keen your follow deals with to always be charcoal concerning athletic looks after. Within the era associated with digital technology, globalization as well as e-commerce, man's existence has halted being the same kind of phenomenon. This particular starts searching more apparent, if a person compared the current fake chanel bags life with this of one fourth century back. Apparently, we now swiss replica watches uk have more Radio stations beaming Replica Hublot watches out applications today, more old digital cameras capturing human being forms as well as nature, and increasingly more DVD gamers and iPods obtaining sold than before. replica Breguet watches Man's existence has certainly been moving by having a fast street since all U-Boat Replica watches of us began residing in the brand new millennium.